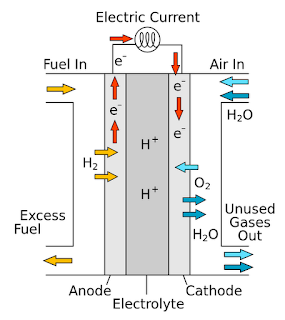 A hydrogen fuel cell is a device that converts hydrogen into electricity. Aside from energy, the other byproduct is water. Just like a regular battery cell, a fuel cell consists of an anode, a cathode and electrolyte. Electrons travel from the anode to the cathode generating electricity. For fuel cells, the energy created can be used to power vehicles, motors, and other devices. Hydrogen fuel cells, at the moment, have components made up of precious metals such as platinum. Because of this, the price of hydrogen fuel cells are at a premium and slightly above the reach of the average consumer. Platinum is used as a catalyst for the chemical reactions that occur within the fuel cell. There are many benefits on the application of fuel cells particularly hydrogen fuel cells. Because the byproduct of a hydrogen fuel cell is water, it is pollution free and environment friendly. The power generated by hydrogen is much greater than that of regular gasoline. Also, since these cells do not need combustion or any moving parts, the device is close to 100% reliable. And as stated, even if hydrogen is used as a combustion based fuel, the byproduct generated is not harmful smog, but water vapor. New research funded by the prestigious National Science Foundation CAREER Award will look at how to safely and efficiently store hydrogen – one of the key problems preventing hydrogen from being used as an alternative fuel. Award recipient Timo Thonhauser, of the Wake Forest University physics department, said current storage methods, such as compressing hydrogen into tanks, are unwieldy, making the storage question the big bottleneck in turning hydrogen fuel cars into a reality. "Simply pumping pure hydrogen into pressurized tanks in your car is inefficient and potentially dangerous," he said. "But even if you could, you just cannot get enough of it into the tank – you'd drive for 50 miles, and then your car would stop. So we need to find a better way to store hydrogen, and that means identifying a material that can safely incorporate it into its structure." The NSF CAREER Award, given to the nation's top junior faculty who demonstrate excellence as teacher-scholars, comes with a $426,572 grant. Thonhauser, an assistant professor, will use this grant to determine whether any of the three substances – magnesium borohydride, ammonia borane, and alkanes – could be used to create a safe and efficient hydrogen storage solution. Hydrogen has shown great promise as an alternative fuel. It is the most abundant element on the surface of Earth, and every nation has access to it. One pound of hydrogen has about three times as much energy as one pound of gasoline, and seven times as much energy as one pound of coal. But even better, when hydrogen combusts, the only byproduct is water. "So, if hydrogen is so cool, why aren't we using it? It's because we don't know how to store it in a practical way," Thonhauser said. "There's no question that fossil fuels are going to run out eventually. Plus, the combustion of fossil fuels creates a lot of problems for the environment. Research into alternative fuels is vital right now." The CAREER Award also requires scientists to develop outreach programs. Thonhauser will work with SciWorks, a science and environmental center in Winston-Salem, N.C., to build an interactive hydrogen fuel exhibition; he also will create a mentoring program at Wake Forest to help graduate and post-doctoral students improve research skills and begin their careers as scientists.